WASHINGTON — Teachers from around Virginia gathered Monday in Richmond for a large demonstration as educators, students, parents and other community members demanded more money dedicated to education. The schedule included a stop at Richmond’s Monroe Park and a rally in front of the state’s Capitol building. 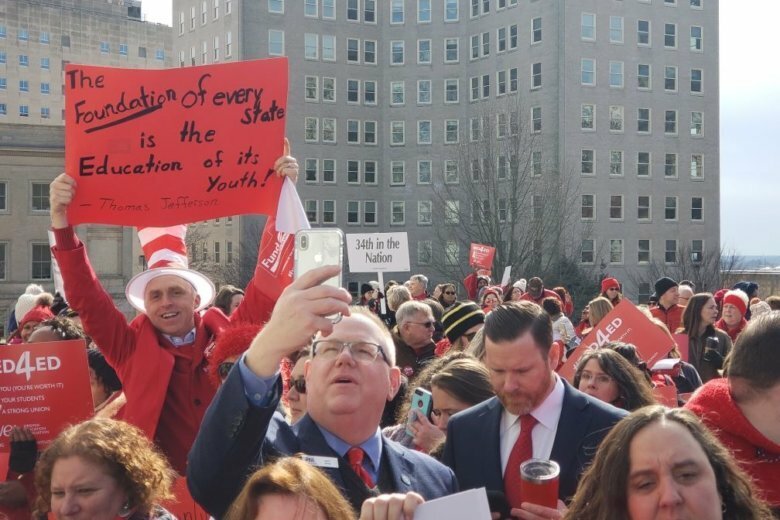 “We are marching and rallying to get more public education funding in the commonwealth of Virginia,” said Kevin Hickerson, president of the Fairfax Education Association. More than 50 members from Hickerson’s union made the trip there. The group Virginia Educators United organized the event, calling for more public education funding and higher teacher pay. “After a decade of budget cuts, Virginia’s schools have reached their breaking point,” the group said on its website. The group said it wants school systems to take steps to recruit and retain high-quality teachers and to ensure that schools have adequate support staff, including counselors, nurses and social workers. There were other rallies planned across the country Monday after Los Angeles teachers declared victory in a six-day strike. They demanded smaller class sizes and more nurses and counselors. In several states, governors and lawmakers are moving preemptively to address grievances by proposing more money for education. The actions have fed off one another since the movement began last spring in West Virginia.